My love of cooking started early. I am surrounded by great cooks. My mother is a fantastic cook, and my Dad used to enter barbecue competitions with his friends and makes the best breakfast I’ve ever had! Don’t even get me started on Grandparents, Aunts and Uncles. For me, cooking is kind of therapeutic. As a sales person, some days my work is filled with a lot of activity and hard work, but nothing comes of it. It can get a bit frustrating. There is always something (hopefully delicious) to show for your work in the kitchen. In my kitchen, cooking is kind of fast and loose, and I don’t really follow recipes (there is a lot of “until it looks right” in my family’s cooking). I’m going to do my best for you though. In fact there’s a story that gets regularly circulated about my Aunt or Mom or Grandma Joye (see how closely I listen sometimes?) following my Great-Grandma Kanelakos around with measuring cups and spoons to make her dump the handfuls, pinches, and all into the measuring cups/spoons so they could get a reasonably accurate measurement. Future generations needed to know how to make her delicious food. (“half an eggshell” of something isn’t…exact). My family didn’t raise any bad cooks, so I’ve had plenty of opportunity to observe some experts. I’ve definitely enjoyed the results! To kick off the cooking series, I’m going to hand you the keys to one of the most versatile dessert recipes I’ve ever found. This is my secret weapon for pot lucks, parties, and…well, anytime you need a fast easy dessert. However, I like you. I’ll share my secret this time. I use this filling to make Cherry Cheesecake Pie, Snicker Salad, and Cheesecake Stuffed Strawberries. I wish I had pictures to share because the results are gorgeous, but…well, we ate them before I remembered pictures. (Sorry…for the not photographing, not for the eating. Who can be sorry about eating? It was all so good!) To give you an idea, in the last two months I’ve made four (4) Cherry Cheesecake Pies, one (1) Snicker Salad, and two (2) pints of Cheesecake Stuffed Strawberries (drizzled with chocolate, of course! )…and it was all so very tasty. Thank goodness for the holiday season, because there were a lot of people around to eat all of this. Mix softened cream cheese with the sugar until creamy. Fold in the Cool Whip. The filling recipe makes two regular sized pies. Spread 1/2 of the filling in the pie crust (make sure there is enough room at the top for cherries) and top with the cherries. Fold the Snickers and apples into the filling. I have no idea where my mom found the idea for this lovely “salad”, but I think my cousin’s wife would disown me if I didn’t bring it to Thanksgiving dinner! You can also make the recipe and take half the filling and turn it into a pie and the other half becomes Snicker Salad. Just add Snickers and apples until it looks “right”. Core the strawberries (I use a paring knife to make sure there is plenty of room for filling). Use a frosting bag with a large tip or a frosting gun to fill the strawberries. I received this Easy Accent Decorator from Pampered Chef last year as a gift, and it works amazing for this. If you like chocolate, and who doesn’t, you can melt the milk chocolate chips with a little butter in the microwave to drizzle over the berries. After the strawberries have been filled, put the berries on a cookie sheet lined with parchment or waxed paper. 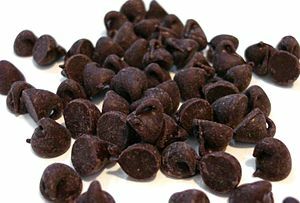 In a microwave safe bowl, microwave the chocolate chips 30 seconds, remove from the microwave and stir well. Continue microwaving in 30 second intervals, stirring between, until all the chips are melted. Drizzle the chocolate over the strawberries, and place them in the refrigerator to set the chocolate. If you’re not a big chocolate fan (Personally, I don’t get it, but I’ve heard there are a few out there) You can crush some graham crackers and dip the filled end of the strawberry in the crushed graham crackers for that crust-like feeling. This entry was posted on Thursday, January 2nd, 2014 at 4:48 pm	and tagged with Cheesecake, Cheesecake Stuffed Strawberries, Cherry Cheesecake Pie, Cooking, Graham cracker, Snicker Salad, Snickers and posted in Entertaining, Food. You can follow any responses to this entry through the RSS 2.0 feed. Yummy Jessica! I think your mom, Grandma Joye and I have all followed Grandma Stella around with a notebook trying to guess her ingredients. “…a scoop of Crisco the size of a large egg…” I have written when watching her make Greek bread. I look forward to trying your cherry cheesecake recipe. Hey, insert a recipe for your caramel-salted cupcakes! I looked for recipes; too many to know which one is best — and yours looked scrumptious. I enjoy your blog — Love you and Happy New Year! Ah-ha! That explains why I know so many different versions of the story! You’re in luck, the chocolate cupcakes with salted caramel frosting is definitely going to be in one of these. Just for you! 🙂 I’m glad you enjoy my posts. Love you too! Happy New Year!